Hello and welcome to Einblick as well as Provocative History! Provocative History will seek to show through a narrative structure an event or character from a historical time frame. While the characters and events will demonstrate themselves through the story, I will occasionally bump in and give insights or helpful comments. This series will come out weekly, delivering History to you, and (hopefully) brighten up those Mondays! Too often the everyday person will overlook history and balk at the idea of reading or viewing anything in relation to the past. Each series will contain anywhere from 3 to 7 parts, with occasional bonus posts on a topic too small to merit its own series, but still fascinating. Without further adieu, let's begin with our first series, Charlemagne! A chilling wind blew over the snowy landscape around the city of Aix-la-Chapelle in the Frankish Empire, now ruled by Lewis the Pious. Einhard wrapped his cloak more securely against the cold; age had begun to seep in. Pacing the courtyard of the great capital, he reached a decision. He turned his steps to re-enter the palace. After making his way to his office, he shut the door, and warmed his hands by the fire. Finally, he took up a quill, dipped it into a pot of ink, and wrote on a piece of parchment, "I have felt that I ought not to hold my hand from the composition of this book..."
Thus it is that people remember Charles the Great, or Charlemagne. Today, scholars call him the Father of Europe. He spread Feudalism through all Europe. Crowned Augustus, he founded the Holy Roman Empire which majorly influenced European History for centuries, as well as began an education system ahead of its time. This is his story. The year is 742 A.D., 110 years after the death of Muhammad, and 124 years before the Vikings land in the British Isles. Spring bloomed in Francia. Pepin the Short, King of the Franks, and his wife Bertrada of Laon celebrated the birth of their son: Charles, named after his grandfather. Charles Martel "The Hammer," defender of Christendom from the infidels. Charles lived a peaceful childhood, being raised in the ways of the church and trained to be his father's successor. When he turned the age of eighteen, however, his father invited him along to conquer Aquitaine. His first taste of battle, Charles would become familiar with warfare. Wielding the sword, he fought for his kingdom, proud to be helping his dad in the duties of the kingdom. Unfortunately, in 768 A.D., when Charles was 26 years old King Pepin died. The Franks called a solemn, public assembly to determine what had to be done. The kingdom split into two parts; one for each son of Pepin. Charles took the northern half, while Carloman, his younger brother, took the southern half. The two brothers loathed each other. Nevertheless, Charles kept his dignity and administrated his kingdom, marrying Desiderata, daughter of the Lombard King after pressure from his mom. One year later, Carloman conveniently died. Though many pointed fingers at one another, Charles managed to avoid any undeserved blame. After a quick assembly, Charles united the two halves of the Frankish Empire, hailed as king. All is well inside of the Franks land for the next three years. In 724 A.D., a Papal messenger arrives: they've been attacked by the Lombards. At this point I need to back up. What on earth is happening here? Well, in most of Italy is a kingdom called Lombardia, named after (you guessed it) the Lombards. They have their kingdom, minding their business when suddenly the Pope decides he kind of wants some land. In the name of God, he declares that the city of Rome is not enough for God's embassy on Earth; they must have The Papal States. With help from Charles' father Pepin the Lombards were forced to surrender land to the Pope. The Lombards were furious about this grievance! Which is why they attacked again and again, each time resulting in the Franks and the Pope fighting back. Which is why King Desiderius figures it's the perfect time to attack the Pope. Because, of course it is. Back to the story. So the messenger arrives and tells King Charles the news. At which point he slaps his forehead with his hand and says, "Seriously? Guys, come on, you've tried this already. Just give up." Or something to that effect. He immediately sends his wife packing back to Italy while he prepares his army to march. 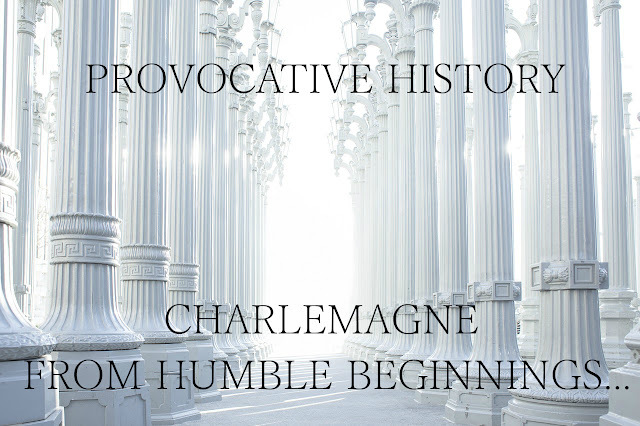 Join us next time when we see Charlemagne take on Desiderius, and things take a new, fascinating turn. Goodbye for now!